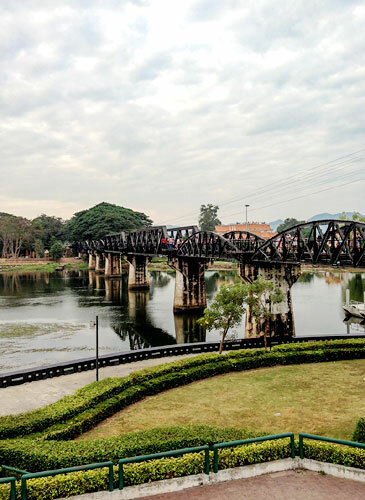 River Kwai Bridge is considered as a remembrance of cruelness during World War II (1941-1945) since Japanese army wants to build a long railway for easily transferring weapons to Burma. 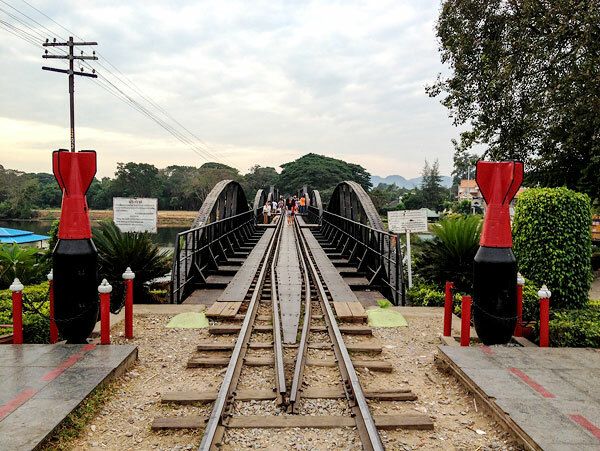 This railway starts from Baan Pong district to Chedi Sam Ong district, approximately 415 kilometers. 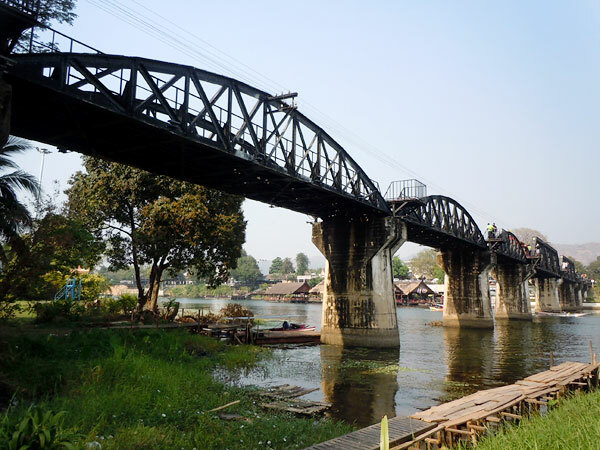 The reason why this bridge is seen as a remembrance of cruelness is because it was built by almost a hundred thousand prisoners of the war, where the prisoners are from various countries, and a lot of the prisoners are also died there (by weariness, malaria fever, wild animals, and starve to death). 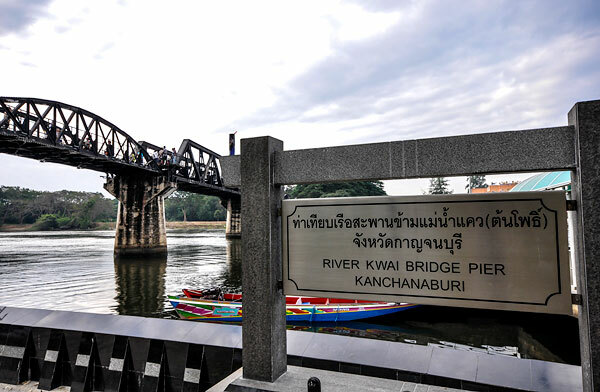 Visitors can walk across Kwai river by this bridge in order to see sight from another side of the bridge. 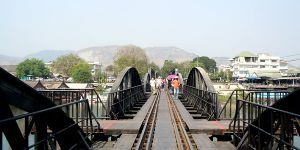 The length of the bridge is only about 300 meters, and there are several pausing points on the bridge for visitors to avoid when a train passby. 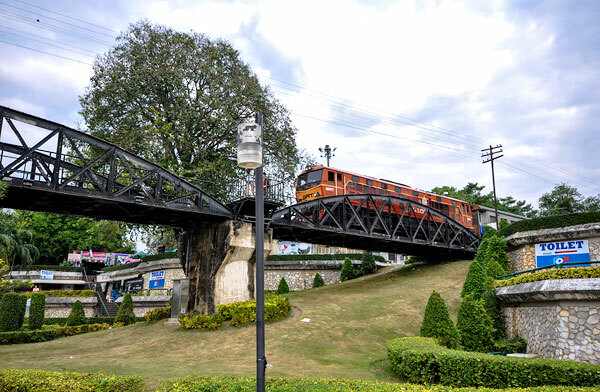 In the case visitors are not comfortable enough to walk across the bridge, there is a tram that comes and goes between the bridge as well. It take about 15 minutes to across the river and come back to the station. Far from here about: 0.1 km. 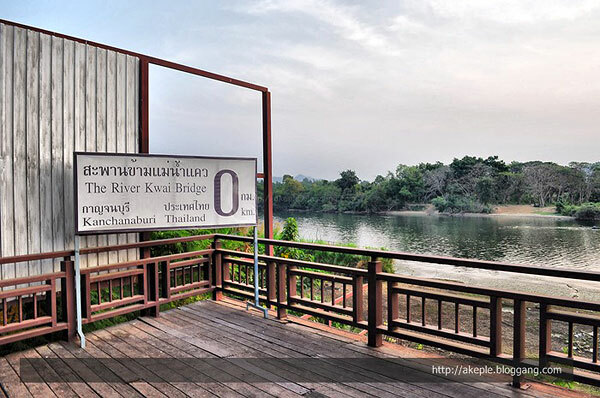 Keeree Tara Restaurant is a famous restaurant next to Kwai River, not far from River Kwai Bridge. The restaurants' reputation is from both outstanding view and great food offered. Visitors can also see the sunset in the evening. At night, customers can enjoy folksong under soft lights in the restaurant. 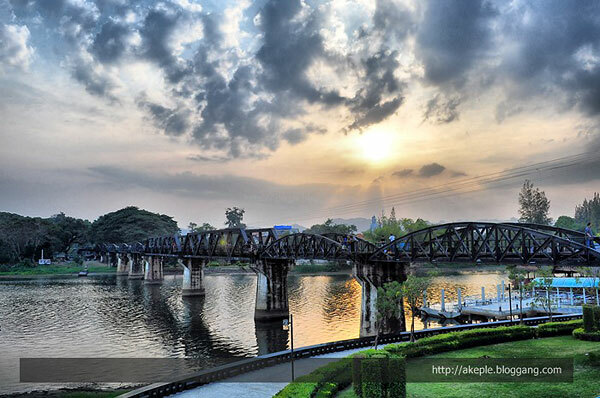 It is a great place for anyone who after a romantic restaurant in Kanchanaburi. 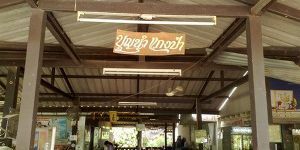 Boonnum Kaengpa Restaurant is another restaurant famous with hot and spicy dishes served. It can well suit Thai customers and those who like spicy food. Spicy ingredient used in this restaurant is own produced by the restaurant, so it can serve strong flavoring dishes towards customers. 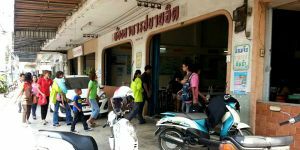 Although this restaurant is not located in the city center area of Kanchaanburi, there are a number of visitors come to have a taste at this restaurant time to time. 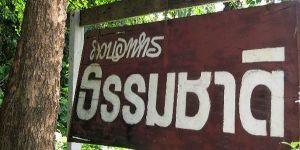 Sabaijit Restaurant has been one of famous restaurants in Kanchanaburi for a long time. 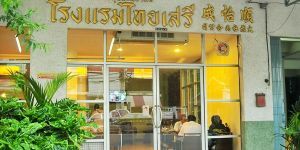 Although this restaurant atmosphere is not as outstanding as some famous restaurants in Kanchanaburi, those who like dim sum and Chinese food usually mark this restaurant as their favorite. 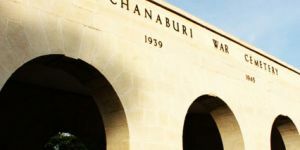 It is also not difficult to find since the restaurant is situated in the city center of Kanchanaburi. Thammachart Restaurant is a famous restaurant providing many delicious dishes for customers to have a taste. 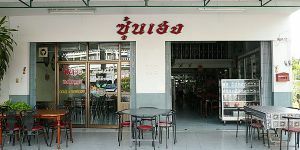 This restaurant also offers many dishes that are unable to be found at other restaurants in Thailand. The restaurant is surrounded with a number of trees so that customers can feel great natural atmosphere while they are eating. 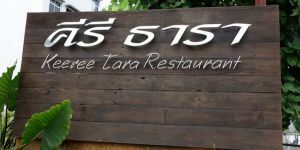 Thai Saree Restaurant is a famous restaurant in Thai Saree Hotel. Both local residences and visitors know well about this restaurant because it has opened for about 40 years already. 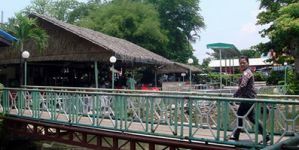 With quality food materials and delicious taste, it can be a showcase restaurant in Kanchanaburi. Currently, there is also a branch of this restaurant on a raft. 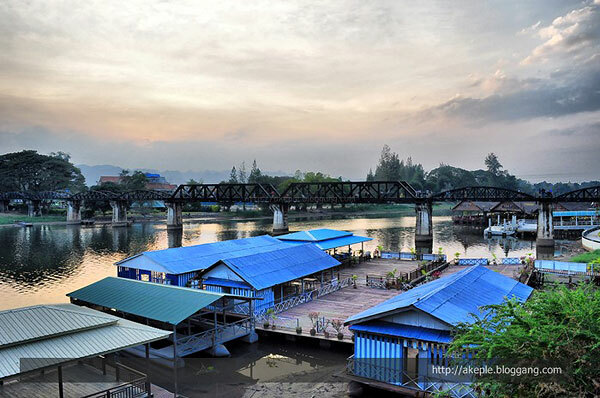 Sun Heng Restaurant is the place producing original non-noodle Pad Thai in Kanchanaburi. 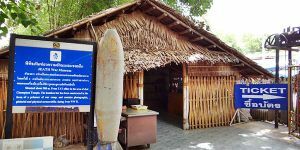 Those who know what Pad Thai is will be in doubt about non-noodle Pad Thai, and when they visit Kanchanaburi, they almost always visit this restaurant to try it. Its taste is also great enough to make customers to come again. For foreigners, Pad Thai can be found anywhere, even in their countries, but this special Pad Thai would be something new to taste. Far from here about: 4.5 km. 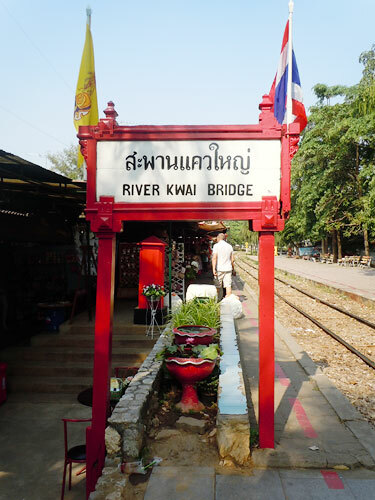 Krua Chukadon is a famous restaurant in the city of Kanchanaburi. From more than a decade ago, customers come to this restaurant more and more because of words of mouse about its delicious taste. 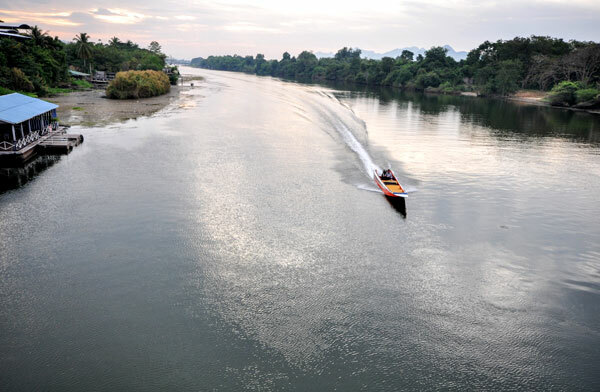 The location next to the river can produce good atmosphere, while food price is also inexpensive even for Thai customers. 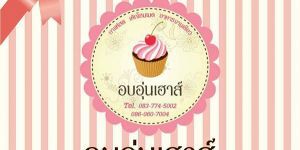 Ob-Oon House is a famous bakery shop in the city center of Kanchanaburi. Customers often come here to have cake or bakery and chill around with free WiFi provided. Ice-cream, coffee, and soft drinks are offered in the shop. Those who would like to have a lunch in this shop can also order a meal as well. 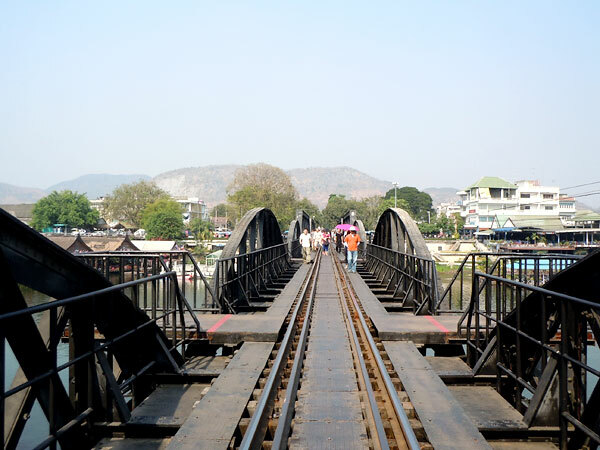 This place can be seen as an interesting place for relaxing and eating something not too much in Kanchanaburi city.